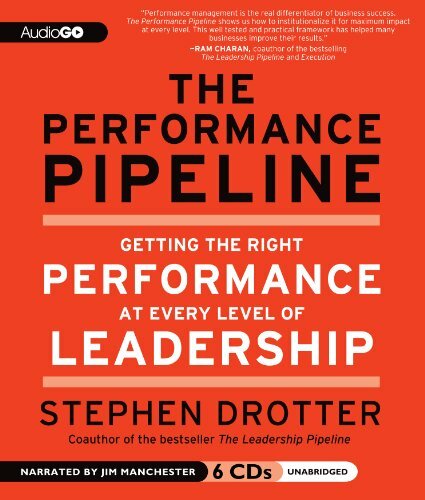 From Stephen Drotter, co-author of the best-selling book The Leadership Pipeline, comes the next-step resource designed to help leaders at every level succeed in an uncertain business environment. The Performance Pipeline is a ground- breaking book based on Drotter’s 40 years of in-depth work with more than 100 companies worldwide. Drotter defines how work flows from top to bottom, and reveals what results each layer must produce and what each layer must pass down to make the layers below successful. Drotter’s Performance Pipeline method was created to be flexible and, can be easily adopted by companies of all sizes and in any industry. Using The Performance Pipeline as a touchstone, leaders and professionals will learn how to measure the work of leaders at every level.Filled with illustrative examples and personal experiences, The Performance Pipeline shows how performance pipelines work in real-world organizations. • How to improve business performance by defining the unique purpose of each layer and providing clarity and focus on the results to be achieved. • How to make all leaders successful by having leaders at every layer pass down to the layers below things they need to be successful. • How to define and install your own Performance Pipeline to obtain the benefits of role clarity and to sharpen the focus of all your leaders at all levels. The First Imperative: Every leader must spend 30 minutes to one hour or more daily in uninterrupted thought. To respond to these four imperatives, you don’t need an expensive “change management” program or a new CEO. Rather, a top-to-bottom architecture that distributes the accountability by layer and defines how work flows down to the appropriate layer is what’s needed. The architecture, the Performance Pipeline, was developed to help leaders increase think time, encourage innovation, provide clarity and enable focus. Every layer has a unique purpose. Every layer delivers unique results. Every layer contributes to the success of the layer below. • Defining the purpose — being clear about what outcome you want. Companies that have made the most progress in creating and using performance pipelines were clear at the outset about why they were doing it. Decide what business outcomes or benefits you want the model to deliver. It will help in choosing the right work and setting appropriate standards. • Collecting the data — finding out what’s really getting done or, not getting done, but should be. Considerable discipline is required when collecting data because it is the aggregate of all responses that counts. It is common to value a few people or a particular function more than others, but you need the full picture to get the best answer. Interviewers must use a standardized set of questions and be disciplined enough to ask everyone the same questions in the same way. The other requirement for interviewers is a deep understanding of what constitutes appropriate answers. • Sorting and codifying the data — organizing data in a useful way. Ask yourself if the story hangs together. In other words, what conclusions can you draw after reviewing all the answers? Does the amount of time your leaders spend calling on customers suggest that leading and managing the team are taking a back- seat? Does the decision-making authority seem reason- able for the expected results they described? Are the obstacles severe or just normal market conditions? The key is looking at the big picture based on all the responses rather than focusing narrowly on a single piece of information. Step 1: Read through one entire interview. Step 2: Pick out all the nouns, because they are the results. Nouns such as strategy, sales, teams, suppliers, expenses and people all provide “clues” as to what is important, and what needs to be spotlighted and measured in this position. Repeat this for each interview. Step 3: Choose the work categories. Step 4: Create column one (“Results”) of the performance pipeline for this layer. Fit all the nouns into the work categories you have chosen. Make a judgment about the adequacy of the list. Step 5: Decide what work elements are missing from the list and make any additions. Step 6: Set the standards (column two, “Full Performance”). Step 7: Define exceptional performance (column three). Step 8: Define the transition in work values. Step 9: Decide what else to include in your performance pipeline. Most companies choose to identify the skills, experience and knowledge required to do the job (column four). • Validating the standards — getting leaders to agree. Before your newly minted performance pipeline is put into practice, interviewees and senior management should review it. Conducting validation sessions with groups rather than individually seems to work best. • Allowing some flexibility — allowing different groups to adapt the standards in order to reflect specific needs. How your performance pipeline gets used is a matter of choice based on your current needs and your feelings about what your people can absorb. You need to know what is happening at every level in your performance pipeline. The reports you receive aren’t enough. Go see for yourself what is going on and why, and then form your own opinions about the progress and state of work completion. The Performance Pipeline helps you know what questions to ask and gives you a map of what should be happening — you know the results that are targeted, so it’s simply a matter of determining if people are achieving these results.